My enduring memory of Operabox’s production of Massenet’s Manon will be Jenna Robertson radiant in orange brocaded silk and exuding charisma. Her Manon was a heroine full of ambiguities and I couldn’t steal my eyes from her remarkably expressive face. Since founding Operabox in 2011 Robertson has made a significant contribution to supporting emerging singers and broadening the operatic repertoire for WA audiences. 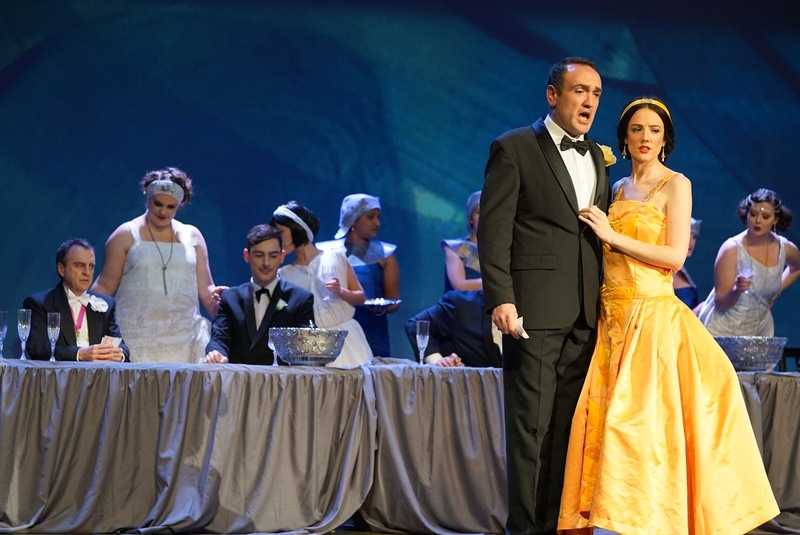 Operabox’s most recent production was a sensational fully staged Ariadne auf Naxos complete with orchestra and chorus and I had high expectations of their similarly ambitious Manon which opened on Friday night. Director Joseph Restubog and his design team (Laura Heffernan set, Stephanie Cullingford costumes, Beth Ewell lighting) set the opera in the egalitarian Paris of the roaring twenties where Manon is bewitched by glamorous flappers and exotic nightclubs. A projection of mottled blue paint formed the backdrop to a nuts and bolts set and assorted (mostly) period costumes (oh how some government funding could make a difference here!). We met Manon bubbling with schoolgirl sweetness and on her way to the convent; “That’s the story of Manon” she explained to des Grieux. Robertson captured every nuance of Manon’s duplicity with her superficial glamour, cruel manipulations, a sobbing Adieu notre petite table and finally her heartfelt penitence. She sung with impeccable French and bright top notes although her coloratura soprano didn’t quite have the lyrical fullness required for the role. Gaetano Bonfante as Le Chevalier des Grieux similarly struggled to find a warm centre to his sound, but his entrancing Act Two ‘Dream Song’ En fermant les yeux with its gently rocking orchestral accompaniment was a golden moment in the opera (despite an out of tune horn accompaniment). The bustling Act Three marketplace was given a vigorous orchestral introduction by conductor Christopher Dragon and his small but responsive pit orchestra but fell flat from there. A few racks of scarves and books made a lacklustre set, Manon’s costume was underwhelming and uncertain direction (Manon’s Obéissons quand leur voix appelle was a confusing mix of comedy and seriousness), meant the drama struggled to connect with the audience. Things began to gel in the Saint-Sulpice scene set up by a hushed orchestral chorale and a lush Magnificat from the six-piece chorus. Manon – in the breathtaking orange brocaded silk and fasinator – entreated des Grieux to give up his priesthood with both earnestness and petulance and there was a visceral connection between the lovers. 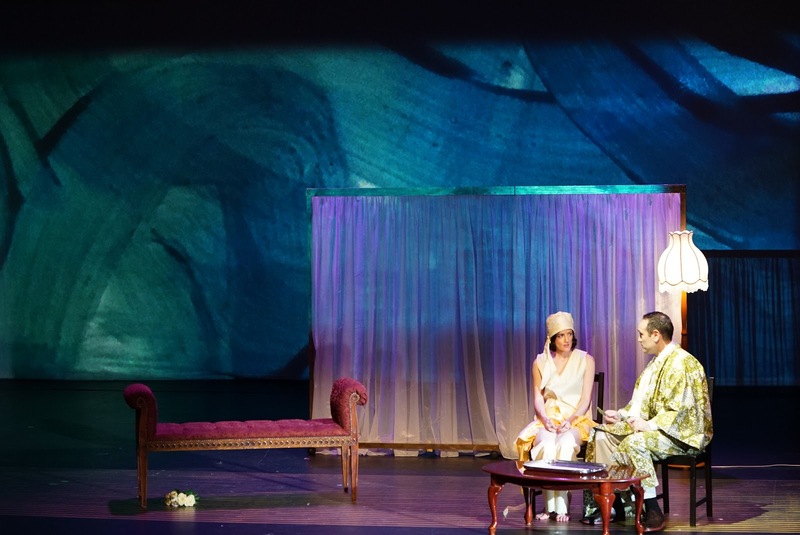 The twists of Act Five can be wearisome as the two lovers debate on whether to stay or leave together and Restubog added another twist with Manon finding inner peace rather than expiring in the final moments. Michael Heap’s resonant baritone made a commanding Comte des Grieux. Simon Wood as Guillot was a natural theatric whose character began to darken as his ill-fated flirtations took their toll. Sitiveni Talei was a slimy de Bretigny and the resplendent Kristin Bowtell was a lascivious Lescaut. The trio of alluring flappers was sung by the spirited Christina Thé, Esther Counsel and Belinda Cox. This was a gutsy attempt at ambitious repertoire. There were moments where it fell short and moments where it soared. But as the heroine would say, that’s the story of Manon. This review first published in Limelight Magazine September 2017.